. : "A souvenir with social feedback." The designer at the exhibit. In my opinion he's certainly done that with his latest project, called "Social Souvenir", an installation piece at the Museum of Contemporary Art in Roskilde, Denmark. Campion conceptualized the exhibit of 300 black t-shirts, each printed with a quote by an artist whose work is featured in the museum, all of which are for sale. Here's the interesting part: when purchasing a t-shirt, you must agree to give your name and address. This information is then entered automatically in Google Maps, allowing the t-shirts to be traced to their new home. 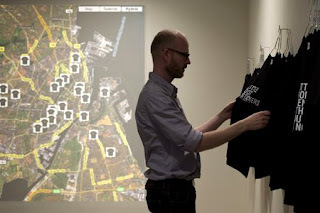 As the Social Souvenir website describes it: "During the course of the exhibition, the 300 T-shirts will gradually disappear from the physical museum space only to re-appear on the web." Ok, so since I'm convinced that stalkers are lurking around every corner I could never do this... but I love the idea of it! Check out the map here.